Are you wanting to create a backyard full of native plants and friendly to both pollinators and nature alike? Then look no further than our 6 tips for creating a pollinator and nature friendly backyard! Be sure to choose native plants for your yard. They require less work than others and are more likely to thrive. Who would say no to more pollinators for their yard? Native plants attract more pollinators because they are familiar to them. If you would like to buy some native plants, do not buy the wildflower seed mixes as they can contain seeds of invasive weeds. Instead, you can buy native plants from Wild about Flowers, a shop that specializes in native Alberta wildflower plants and seeds. 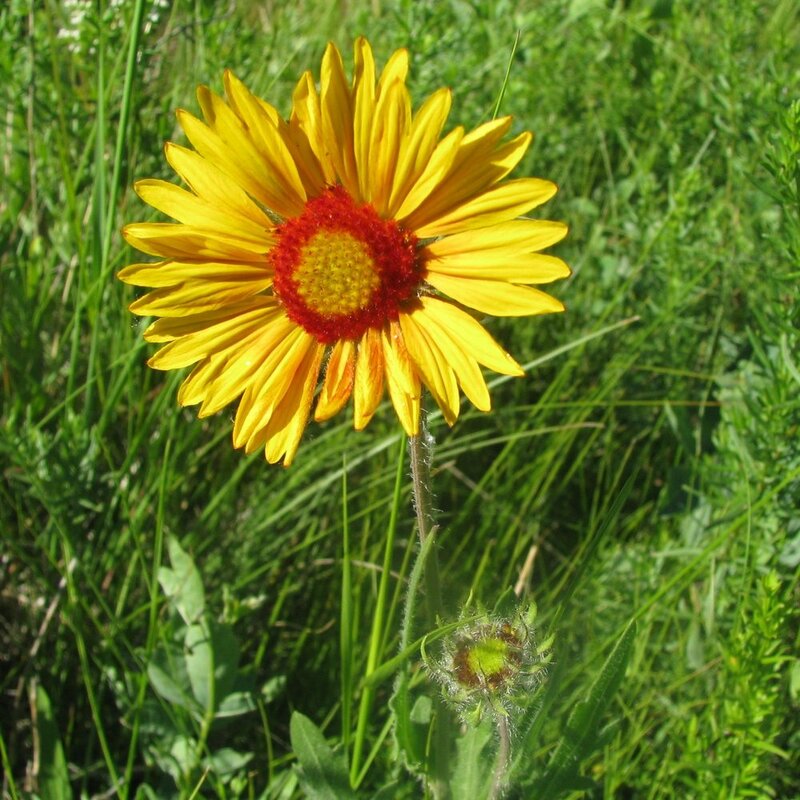 In addition, the Edmonton Native Plant Society has a list of native plants for the Edmonton region. Did you know that not all bees live in hives or groups? Most of the bee species in Alberta are solitary bees, such as mason or leafcutter bees, who live solitary lives and aren’t aggressive like honeybees. Females require a safe space to lay their eggs, typically, old and/or rotten trees are perfect. 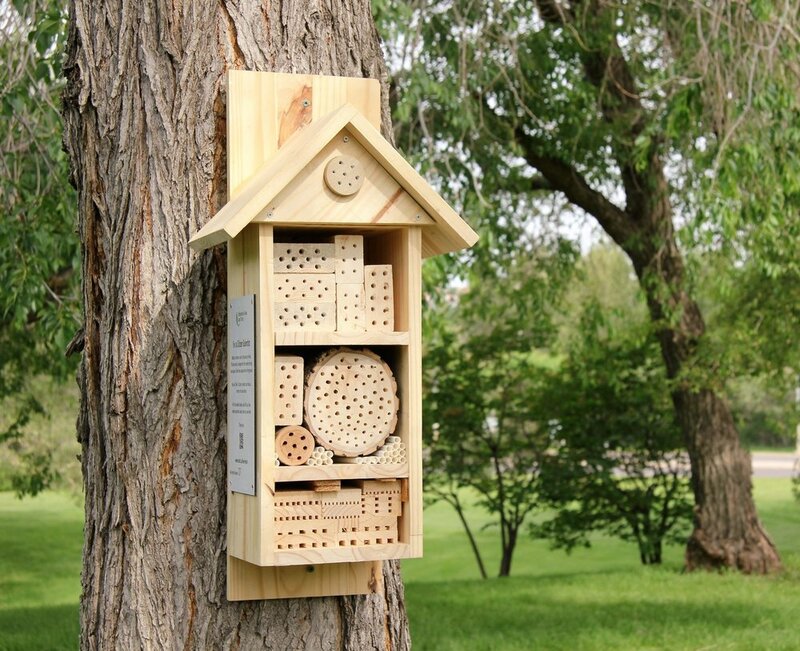 Unfortunately, there is a shortage of those trees and pollinator habitat in general, so the next best thing is to create an artificial habitat, a bee hotel! We have building directions on our Protecting Pollinators webpage or we will be selling them ready-made on our shop in the near future. To encourage birds to visit or even stay in your yard, you can put up a bird box or two for nesting or roosting, and a bird bath for birds to clean up in or drink from. We have directions on how to build bird nest boxes or we have them for sale at our shop. A bird feeder or two with different types of feed would be a perfect addition as well! Many materials can be recycled or reused for preparing your plants for your garden. Cardboard tubes and cardboard egg carton cups can be used as mini planters to develop seedlings which you can then plant in the ground. The paper will break down in the soil. Plastic bottles can be used as mini greenhouses for individual plants by cutting off the bottle neck and upturning it over the plant. Use clean barrels to collect rain water for your garden and yard, and make sure to put a cover on the barrel to prevent wildlife from accidentally falling in. Water your garden in the evening to minimize the loss of water to evaporation. Increase how often you water, but water less each time to reduce runoff. Only water when your plants need it. When mowing your lawn, set the height of the mower higher and leave the clippings on the lawn. Moisture and nutrients from grass clippings encourage the grass to grow thicker, minimizes weeds, and reduces the need for watering. Leaving your clippings on your lawn also reduces the amount of waste being collected and the amount of water and fertilizer being used. For more information, the City of Edmonton has a webpage on going bagless and why it is important.